The Greater Patagonian Conure is sometimes known as the Burrowing Parrot or the Bank-burrowing Parrot. This is because they have been known to 'burrow' up to 6 FEET into the side of a cliff or a bank just to build their nest! This genus consists of only the one species, of which there are three subspecies. Both the Patagonian Conure and the subspecies, the Greater Patagonian Conure are becoming common in captivity as they are growing in popularity. Besides 'big feet' and the ability to 'burrow' the Patagonian Conures have some other very distinctive features. They are some of the largest conures, they tend to look more similar to macaws than to other conure species, and they have an unusual brown coloring. These birds are very social and love companionship, their natural behavior is to live in very large groups and to nest closely to one another. They make a very fine and affectionate pet. Being quite intelligent, they are good talkers. However they do have a harsh voice and can get rather loud. This along with being very sociable makes them an ideal aviary bird. The Patagonian Conures originally got their name from Patagonian, an area that is now included as part of Chile and Argentina. They are native to central Chili and the northern and central parts Argentina. They inhabit open country and especially like areas around water. They have also been noted to be very destructive to crops. In Chili these birds had been greatly depleted, largely through collecting of the young by natives to be eaten as delicacies, especially during the feast of Saint Andrew. Today they are better safe-guarded as Chili granted them legal protection in 1967. The Patagonian Conure is a very large conure with the Greater Patagonian Conure being even larger still, about 2 inches longer. The head, neck, and upper back are olive-brown with some tinges of green, while the Lower back, rump, upper tail, and underparts are more yellowish with an olive tinge. The thighs and the center of the abdomen are an orangish-red. The throat and breast are grayish-brown and there are white markings on each side of the upper breast. These white markings are much more pronounced on the Greater Patagonian Conure than the nominate species as well as their having brighter and more intense yellows on the underparts. The wings are olive with the outer feathers being blue moving down to a bluish green on the outer secondary feathers. The tail is an olive-green tinged with blue on the tip and brown underneath. They have a white eye ring surrounding a yellow eye. The beak is gray and the legs are a flesh pink. A younger bird will have a pale gray eye ring and the beak is almost a horn color. A roomy cage is required unless the bird is to be let out for extended periods. Many birds can spend most of their time on a play pen or parrot perch. In the wild the Patagonian Conure eats seeds, berries, fruits, and probably vegetable matter. As a pet they will enjoy a variety of sprouts, seeds, fruits, vegetables, and commercial pellets, as well as the same nutritional foods humans eat. They are very sociable and have been recorded to live in very large flocks. Today they are not as abundant and are being seen in smaller flocks. They enjoy being near to each other and even nest in close proximity to one another. Their social behaviors make them wonderful pets and they are very intelligent and good talkers. However because they do have such a loud harsh call, they are also considered to be excellent aviary birds. In the wild these birds nest in burrows dug out in cliffs or banks. Sometimes this burrows are up to six feet deep. The hen will lay three to four eggs which are incubated for about 24 to 26 days. The young fledge (leave the nest) in about 80 days. See About Conures: Breeding/Reproduction for more information on breeding. Potential Problems: This bird has a loud harsh call and can be noisy. This bird is becoming more available as it is increasing in popularity. I am looking for a Patagonian conure. Could you tell me about yours? Thank you. Is your patagonia still for sale? are you still selling your Patagonian Conure? I have one at the moment and I want another one so that mine won't be lonely. Do u still have your Conure? 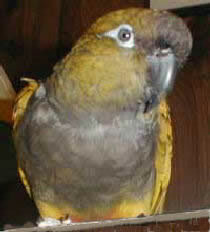 I am looking for another Patagonian Conure. I have one as a pet now, have had him for 5 years now. I feel that he needs a friend. looking for a patagonian conure. need to be shipped to maine. shari is your conure still av? still looking for a pat ! I am interested in your male patagonian conure. Please let me know if he is still for sale. We have them, take a look at our website. Delta ships at 156. your also going to need a crate 25.